It was our first day of electives, but before the wake-up bell even sounded, it was time for our Pine Manor campers to depart for the Canadian. Cabins Pine, Manor and McCabin boarded a bus headed for Atikokan, Ontario, where they will spend tonight at Canoe Canada Outfitters, before embarking tomorrow morning on a camping trip for the ages. They will spend nine days in the Canadian wilderness in Quetico Provincial Park, as they canoe and portage their way through pristine country. We are very proud of our group of Pine Manor campers and look forward to hearing all about their trip when they return. Meanwhile, at camp we had our first day of our regular program, which was anything but regular with our great staff at the helm. Yesterday, each camper selected his own schedule of electives for the week, and today they began to participate. (Read more about the NSC Program) We had great activities running from the athletic fields to the waterfront. To see the pictures, check out the Summer Pics. All around camp, you could see counselors providing great instruction to all of the campers and helping them improve and enjoy! Some afternoon drizzle was not going to stop our campers from having a blast. 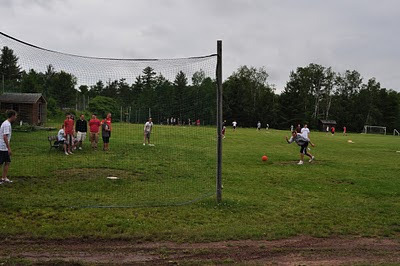 We had our first round of Challenge Games, which saw our J-1 and J-2 campers going head to head in an epic game of kickball. We had two games of Ultimate Frisbee, a game of Continuous Dodgeball, floor hockey, and softball all playing on until the sun would shine again. After dinner, we had the first Wanegan of the summer as new king Andy Rodheim led the cheers for candy! The rain stayed away for evening program, which allowed for a round-robin football extravaganza, a Baggo tournament, disc golf, and much more. This was only the beginning of a great summer! The kids have unpacked and new campers have been given a tour of camp. (Well, actually the baggage is still in the truck because of the rain and we'll unload after dinner. The tour will take place later also. It looks like the rain will have passed by dinner time) I imagine that most kids will be playing in some kind of activity and learning the names of all the kids in their cabin. More outside activity this evening followed by the traditional candlelight ceremony. Led by the counselors the kids will share their goals and expectations for the summer. This will be the first of many cabin discussions that are an important part of the "team" building goals that we have for each cabin group. Tomorrow the kids will have a busy day as they get checked out by the medical staff, take a swim test, choose their 1st weeks schedule and find time to play several games of dodge ball and capture the flag. Tomorrow evenings program is the staff talent show. Let me tell you about our staff. In a word, they are awesome!! We have spent the last week training our guys and we have really enjoyed spending time with them. Many of them are returnees from previous years so we already knew their talents. Our new staff members have brought additional musical skills, humor and they just seem to be the nicest guys. Everyone is getting along so well that the week has been an absolute pleasure! And the pre camp staff talent show demonstrated that this group has real talent. The kids will see it tomorrow. And these guys provide us with so many laughs in such creative ways. After 6 days of training they were given time off Saturday afternoon and evening. Sue and I have learned that the stories the day after the first night off are entertaining. This year was no different. Our CIT's are 16 year old former campers and this time off is for many the first time they have done their own laundry. Our CIT Director, Jeff McCormack actually wrote out a 10 step instruction manual on doing laundry. Not everyone paid attention. We heard about Benji Friedman trying to stuff his bed sheet into the lint compartment of the dryer. We heard about Jeremy Schmetterer who washed his clothes but forgot to put in the laundry detergent. But the best story of the night belongs to new staff member John Sheehan. After laundry and after dinner about 40 guys decided to go watch Toy Story at the movies. Well, wouldn't you know that a group of Birch Trail (nearby Girls Camp) staff members also decided to go to the movies. So John's brilliant idea was to sit in every other seat encouraging some inner camp socialization. The ladies walked in, looked around and walked to the front of the theater and watched the entire movie with stiff necks. And we haven't even started yet! Aw... Summer camp!! I guarantee that your kids will have a fantastic summer. Our staff is committed to insure a fantastic experience and after spending the week with them I am positive they will be successful. Our overnight trip program begins with a roar on Wednesday when our oldest campers leave for 9 days on their Canadian camping trip. Throughout their camping careers they have taken cabin trips with their bunk mates ranging in length from 2 days when they were younger and then went on 3 and 4 day trips before the Canadian adventure this summer. We'll tell you more as the summer progresses. This is the first of a series of Letters that I call "Leb's Ramblings". They will be posted on the website at www.northstarcamp.com in the The Lodge under the Media Room and called Leb's Ramblings. The Pictures are in the same area but appropriately called Summer Pictures. On a regular basis we will be posting pictures on line. Pictures will be available as soon as possible but perhaps not until Tuesday because of the weather. The countdown on Leb's Ramblings now reads "1 Day!" The staff at camp are so excited for the campers to arrive and get the Summer of 2010 underway. We can't wait to see you all tomorrow at the buses and the airport. 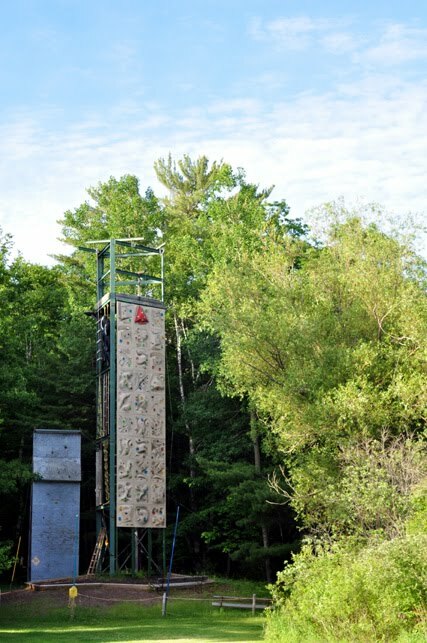 We have campers coming to North Star this summer from 20 different states and internationally as well, and the real fun begins when you all arrive tomorrow. If you have any last minute questions, don't hesitate to contact the office. 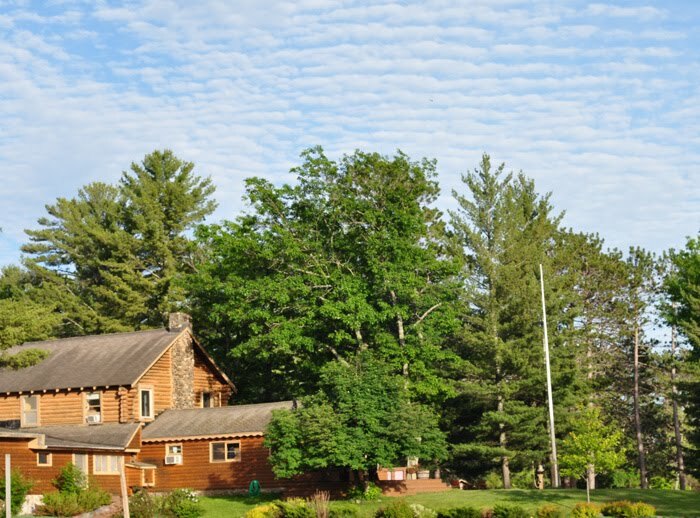 You can reach us for anything at 715-462-3254 or at office@northstarcamp.com. See you tomorrow! With only two days until camp begins, you can feel the excitement building in the air around here. Some of our staff have been here for almost a month getting camp ready and getting trained in their various activity areas. More importantly, our whole staff has been here the last week receiving the "North Star Doctorate in Child Development," as we prepare them to take outstanding care of our campers. And most importantly, we have seen that the 2010 North Star Staff is incredible! Pre-camp orientation is a jam-packed week that includes everything you can imagine. We start with getting to know you games and tours of camp. Everybody gets introduced to the North Star program, philosophy and they learn as much as they possibly can in preparation for the arrival of the campers. There are a lot of preparations made for each program area and work details to be accomplished around camp. And of course we have a little fun as well. We had a great staff show on Thursday night that included talents of every variety, from musical to comical, and even some carnival acts. We had our first gathering at the Council Ring on Friday night and a formal retreat preceding it. We have had a great week and still have two days of preparation ahead of us to make things even better. But if you were here, you would no doubt feel that this staff is primed and ready to make the Summer of 2010 unforgettable! Today officially marked the end of Pre-Pre Camp with the start of new staff orientation. With that arrived about 20 more guys... the rest of our new staff and all of our Counselors in Training. To mark the end of pre-pre camp, we've got two pictures. The first is actually not at North Star, but rather a few hours away at the Brule River. Our trip leaders scout several of the trips that cabin groups will take over the summer and today I dropped them off at the Brule, which they'll paddle for the next few days. They were very excited about the high water levels that they found upon arriving at the landing. Here our six mighty trip leaders headed down river to start their three day excursion. For our second picture...a game of staff kickball! What better way to start pre camp? Leb challenged some of the early arriving new staff to come up with an activity that everyone could participate in. Day one of pre-camp ended with Leb taking the new staff on a tour of camp and Jeff met with his CITs. Then it was up to the lodge for snacks and games of cards and celebrity! We'll do our best to post pre-camp pictures of the day now that pre-pre camp is over. Once the campers arrive, we'll regularly be posting pictures online for everyone to see! A little bit of teamwork went into getting the Hobie Cat ready for the summer. 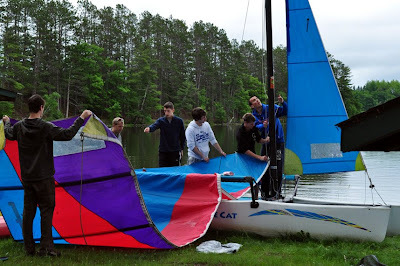 Here several of our counselors help sailing instructor Dan Riemersma get the sails set after they put the mast into position and secured. At the moment of this writing several staff are actually out on the Hobie... unfortunately it decided to rain in the middle of their excursion. Congrats to our staff who participated in life guard training. After four days of rigorous training with our hard nosed trainer Mandy, they all have passed the course. The course was finished in time for everyone to head down to Leb and Sue's House to watch the US take on England in the World Cup. We do have a few counselors from England and everyone was civilized during the game. Yesterday was moving day for our swim docks. It seems like this is a hallmark both of the beginning of the season as well as the end of the season. In August, once post camp is done, the swim docks come apart and get relocated on shore. Then, in the spring the docks head back towards swim point to assume their natural positions. So Thursday was moving day... but we were kind of worried. See in August we moved the docks towards shore and Leb was a little worried that they may float away. Well, they didn't. The docks stayed put as the water levels receded a bit, leaving some really heavy docks stuck on shore. 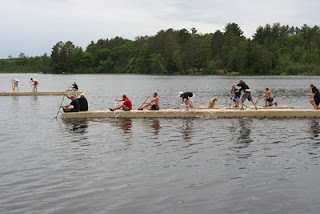 We pondered a few options for getting them in the water and decided to just get as many people as we could find (about 20 or so) and try to pick up the docks and drag them into the water. It worked. 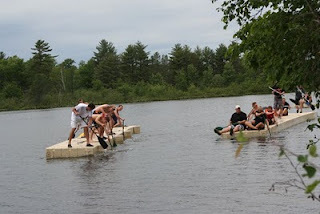 Once the docks in, we needed to get them down to swim point, and the staff decided to make some fun out of it and paddle the docks out to swim point. You will notice one free loader, Mack (the dog) Shlensky aboard. He made it about 3/4 of the way to swim point before decide it may be quicker if he just swam the rest of the way. We added an extra picture of the docks coming down the stretch to swimpoint. 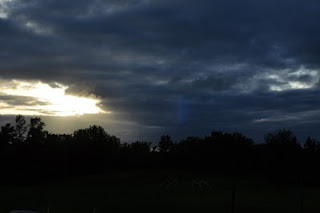 While we're on the theme of clouds... a few days ago we had a rainy day (even though it never rains at North Star) and the sun broke through the clouds for a few minutes. Today all of our life guards took their in-pool testing... Mandy, who does the certification reports that our campers will be in good hands this summer on the waterfront. Our first canoe trip departed today as well. The trip leaders headed out to the Flambeau River for a scouting trip. 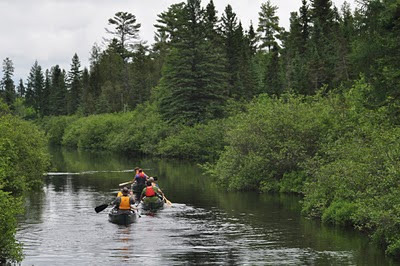 The trip staff scouts many of our trips as part of their training and will take trips to the Brule and Namekagon Rivers as well as the Porcupine Mtns. The trippers were pulling for a mini-Canadian... maybe next year. There isn't much to explain about this pic... other than I really liked the clouds above North Star's main lodge. Life in the Northwoods has heated up as we've expanded to 39 people with the latest arrivals, Jeff, Kim and Lake McCormack, as well as our Village Directors. Our trip leaders will take their first trip out tomorrow, too. They, along with our counselors taking life guarding hope for good weather! We'll keep the post short tonight as we know that many of you are watching some Stanley Cup Hockey. While this view does not necessarily represent North Star, I happily say "Go Hawks!" 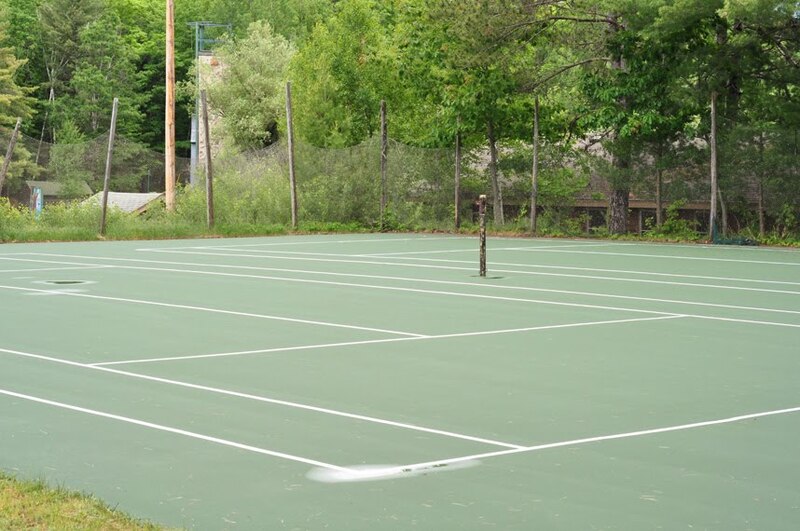 One of the biggest changes everyone will notice this summer is the improvements to our tennis and basketball courts. The Wisconsin winters take a toll on the courts as a small, hairline crack can turn into a the Grand Canyon within a matter of a year or two. This spring we had the courts fixed up. All cracks were filled and the courts were resurfaced. Here you can see the crew applying the first of two layers of green paint, before lines were ultimately painted. The courts are all in great shape now and we know Tennis Mike and the rest of the tennis will be thrilled with their new digs. 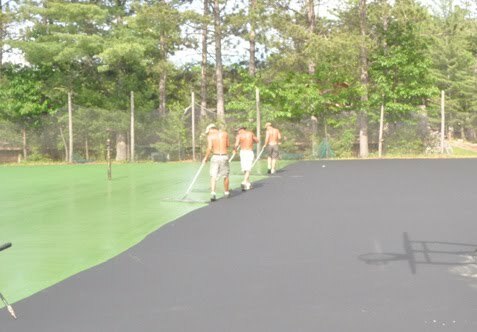 Here's a bonus pic... a shot of the completed tennis courts. 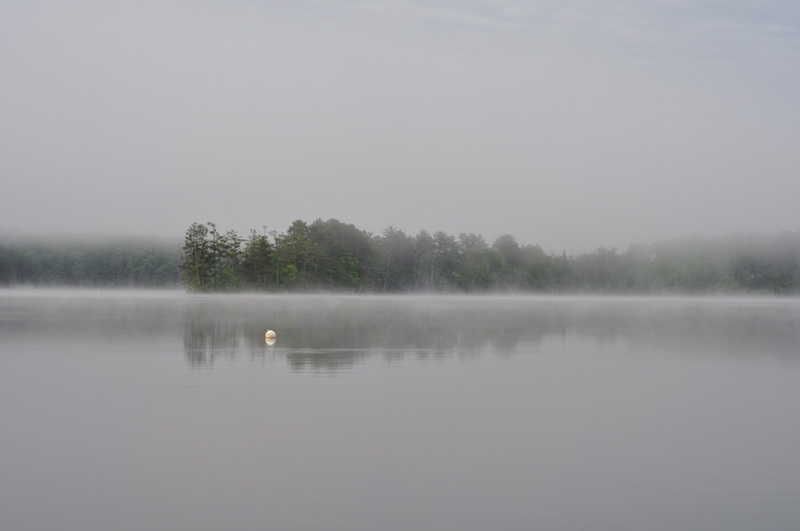 Rain descended upon the Northwoods today as we got some much needed precipitation. More counselors have descended upon the camp as well... our entire trip staff and kitchen crew will be here by nights end as well as the rest of the counselors taking life guarding. Our climbers have gotten so good that we decided that we needed to add a new challenge to the climbing wall... so we've removed the bottom two rows of panels and climbers are going to have to figure out creative ways to get up the wall. This is actually how we keep the climbing wall over the off-season. The bottom two rows of panels are removed at the end of August and then re-attached before the campers arrive. Our first batch of counselors have finally arrived. We had four counselors who arrived last night... strike that, they arrived this morning. Due to flight delays they didn't get to camp until about 1:15am. Not too much for guys who had spent the previous day plus flying from places like Australia, New Zealand and the UK. More staff arrive tomorrow and we'll triple in size between now and Thursday as we welcome staff taking life guarding, our trip leaders, more kitchen staff as well as our administrative staff. No... the water level of the lakes isn't that low and we didn't fall victim to a rogue pontoon boat driver who decided to park in the middle of the Junior Village area. We have an armada of boats that are waiting to be put in the water. We started putting docks in the water at the end of last week. As you may or may not know, lake levels across the upper midwest have really dropped over the past several years as we've seen prolonged drought conditions. To combat this, we've relocated where we park many of our boats. Last year we moved our ski boat lifts and this year we've moved our fishing boat piers, all are now along the side of the Ridge. They now sit in higher water areas with less muck. We hope to get the rest of our piers and swim point docks in place this week. 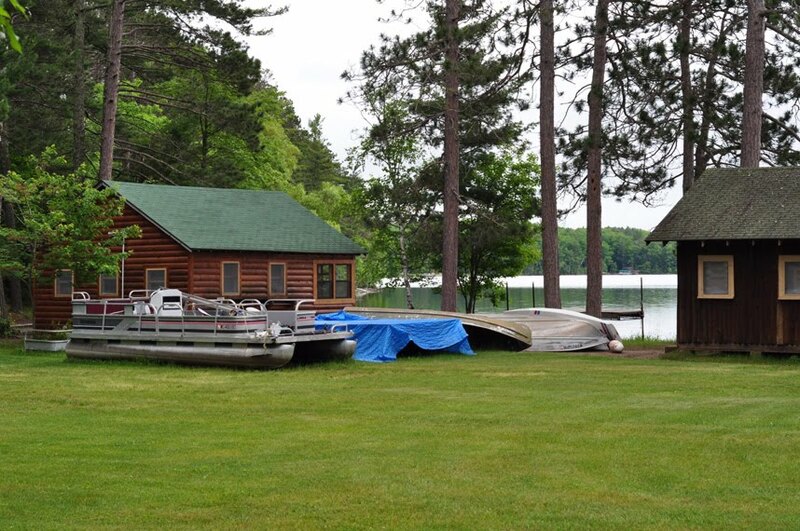 Our cabins will begin to fill up later tonight. We have our first four counselors arriving later. Three of them will be here for less than 24 hours, though, as they'll head over to Camp Timberlane for a few days of climbing wall training. As you may or may not know, our staff actually live like campers for much of pre-camp training. We assign all of our counseling staff to live in J-Village cabins. They'll get to know their pre-camp cabins before being assigned to the cabin groups/counseling teams that they'll spend at least the first session with. Our administrative team will work to get to know all of our counselors so that we can put together the best teams. 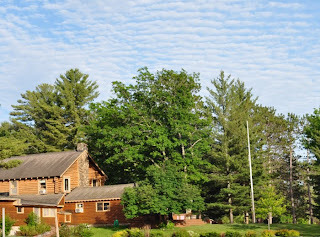 Greetings from the Northwoods... while camp is still a few weeks away, things are coming to life on the shores of Spider Lake as we have a crew of about a dozen getting camp ready. Docks are being put in the water, athletic fields mowed and boats cleaned. 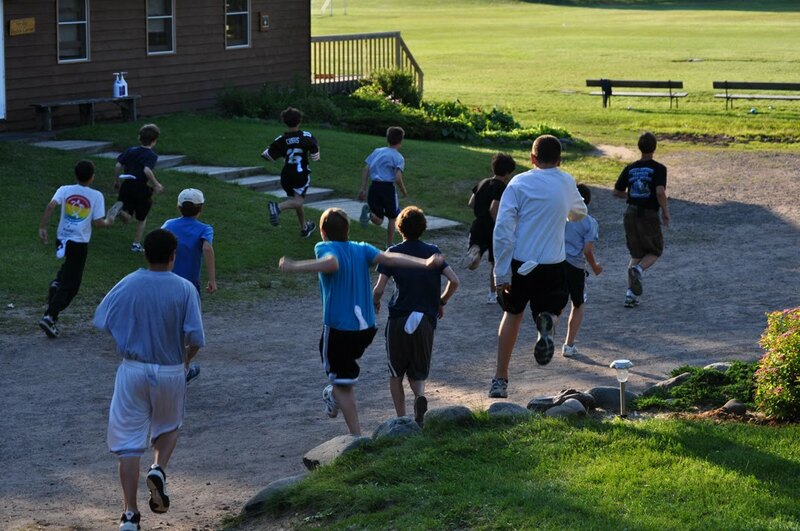 Within the next few days our group will grow to about 40 as counselors, trippers and support staff start arriving. We'll certify about 12 staff in Life Guarding here at North Star starting on the 9th and our trip leaders will begin their training that same day. Over the next week or two I'll do my best to share a "pre-pre camp picture of the day" every day. Its great to see camp come to life and for most campers and staff, you don't get to see what J-4 looks like piled high with canoes or what the the fields look like before they've been mowed and lined. I took this picture this morning at 6:45. 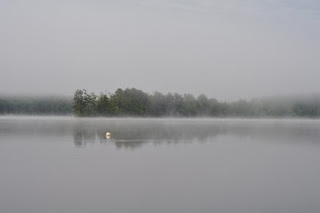 Mandy (Stanek, our waterfront director) and I drove down to Rice Lake to pick up equipment for the life guarding course, necessitating an early rise. As I drove by the lake, with the steam rising over Brewer's Bay I figured that there (hopefully) wouldn't be many mornings that I'd be up at 6:45, so I decided to take advantage. Enjoy today's picture and I'll post more as we head towards the start of camp.